There are many types of Great Pyrenees breeders. Are they all equal? How do they differ? What can you expect from them? We are here to tell you they are NOT all equal and what you don’t know CAN hurt you. There are more Great Pyrenees breeders than those you see in the show ring with their Kennel Club registered Pyrs. Let us tell you about them, not from a breeder’s perspective, but from the perspective of those of us involved in the rescue and placement of many homeless Pyrs. 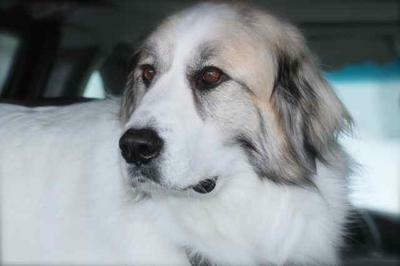 As a breed specific Great Pyrenees rescue, we take in owner surrenders, strays and neglected Pyrenean Mountain Dogs. It has become increasingly frustrating and sad to see that the majority of Great Pyrenees dogs that people want to surrender to us originate from litters produced by farmers’ working dogs, backyard breeders and puppy mills. ...what you don’t know CAN hurt you. So, let’s talk about farmers as Great Pyrenees breeders. Now we know that farmers are fine folks and care about animals. But they have a practical approach to them as well. 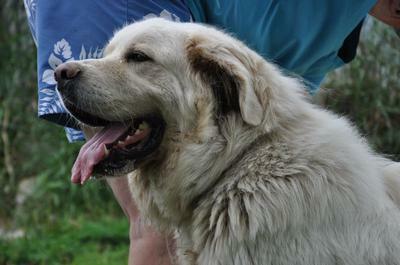 In fact many of them use Livestock Guardian Dogs (LGD’s) as guardians for their flocks and herds. They are working dogs but they still must be socialized to people. Because farmers are in need of a younger replacement working dog as their present ones age, they will breed their working dogs to get that one pup. The rest they will sell off to unsuspecting buyers. In many cases, the buyer has not done their research, and just sees a cute, white, fluffy puppy they want as a companion. And, yes, many buyers do the right thing by socializing and training their pup but that was not done by many many different people in the first 8 weeks with the farmer. That first 8 weeks are crucial to a good canine citizen. The pup has not been socialized with humans in its first 13 weeks of life, which is crucial, if the pup is to have a chance to successfully integrate as a companion or working dog. In other cases, the pup has been taken from its mother too early. This dog is the product of two dogs that are not bred for sound temperaments. Poor genetics can come into play, as well. Sometimes, these dogs are Pyr/Maremma/Akbash crosses. Maremmas and Akbashes are not recommended as companion dogs due to their even more protective nature than that of a Pyr. 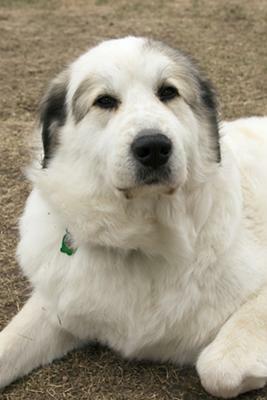 We receive most of these Great Pyr surrender applicants when these dogs are anywhere from 1.5 to 3 years old. This is when they are maturing and in their teenage stages. That is when their true nature emerges. And for the Pyr, being an independent thinker is a part of their true nature. One reason many people want to surrender their Great Pyrenees Mountain Dog is because the dog has bitten someone, sometimes more than once. We, sadly, cannot bring these dogs in. Our years of experience in Great Pyr rescue shows that they cannot be safely rehabilitated, and, therefore, cannot be adopted out. It would be irresponsible for us to place a biting dog with anyone. Think about it. Would you adopt such a dog? And that leaves us with only one very sad conclusion. We can only recommend that the dog be euthanized. Then, there are also dogs so fearful and poorly adjusted, that we cannot even give veterinarian care. Unfortunately, we do not have the resources to work with fearful dogs so unless experienced people are willing to step up to rehabilitate these dogs, we cannot bring them in. And, even when someone can help, there is no guarantee that the dog can be helped to the point of adoption. Sometimes, people have tried to do the right thing by having the dog trained. Unfortunately, if it is not the right trainer, and force is used, this will compound the issue even further. Here is what Jade Hill, a trainer who specializes in Great Pyrs, has to say about that: “They [Great Pyrs] do not respond well to any level of harsh treatment, and will often become very reserved or introverted if they are treated as such. They are definitely not a breed that will tolerate harshness from their handler and will resort to retaliation if it is applied, maybe not immediately but eventually.” So do you get the picture? Not only elephants have great memories. Now imagine a big 120 to 150 pound dog with attitude! And, it’s not their fault. Simply stated, farmers should not be selling these pups as companion pets. It is rarely successful and sad and tragic endings are the result, more often than you can imagine. Yes, we see a lot in rescue… and it’s heartbreaking. Simply stated, farmers should not be selling these pups as companion pets. But of course, farmers are not the only Great Pyrenees breeders. We have another group to deal with and they are the backyard breeders. Many of these people do not usually have bad intentions, but the result can be devastating. Many of the homeless or abandoned dogs come from this category and end up being euthanized in crowded shelters. They are sold online, or sometimes, in pet stores (ethical breeders will never sell to a pet store) and the ‘breeder’ never knows what happened to the pup nor do they care. Many backyard breeders do not have the knowledge to bring these pups into the world. They have short-term goals like having their kids see puppies come into the world or, they do it for profit. And what does this mean to you? You may end up with a dog similar to one coming from a farmer. You may end up with a dog that is not healthy or has a poor temperament. You may end up with a big dog that you are unable to manage at best, or even worse, one that you absolutely fear. Then what? And here is the sad truth… none of this is the dog’s fault. So we beg you, please, do your research… not only on the breed but also on Great Pyrenees breeders. We have a wealth of information on this website. You will be spending anywhere from 10 to 15 years, maybe more, with your companion or working dog. It would be well worth your while to spend a few hours to learn about this magnificent dog to find out if it is, indeed, the breed for you. That investment of your time can make a world of difference. Interested in learning more about Puppy Mills? We have information for you here. Do you know how to select a good Great Pyrenees breeder? Learn here. Interested in finding Great Pyrenees breeders? Here they are. Return from Great Pyrenees breeders to Home.